The Milky Way above Nant Peris. Photo by JixxerKris/ Shutterstock. Can't handle another crowded causeway? Maybe you'll fare better on a wondrous wintery night walk. In December 2015, Snowdonia was officially crowned the world’s tenth Dark Sky Reserve. In celebration of this event, we go through the best way to experience the national park in all its starry glory. Night walking is certainly more hazardous in winter – but if you’re handy with an ice axe, confident in your navigational skills and savvy in snowy conditions, it’s the perfect way to continue experiencing the hills during those endless dark evenings. Safety is paramount, so if you’re hitting the high places after sunset then make sure you pick a night with a settled forecast, check avalanche conditions in your chosen area, and go properly equipped with good head torches, emergency provisions and plenty of warm gear. For more advice on exploring the dark side safely see this article on how to go hill walking at night. You can enjoy a spot of post-nightfall rambling anywhere, but Snowdonia’s new Dark Sky Reserve status makes it a top option. Here’s our pick of the national park’s best stargazing spots. Weather permitting, the park’s namesake mountain makes for one heck of a night hike. After hours when the tourist hordes are tucked safely up in their beds, the mountain is magical and the summit area itself offers several relatively sheltered spots where you can hunker down in a nest of Primaloft and Gore-Tex to admire the Milky Way. But choosing a path up can be tricky. Make sure to avoid the Llanberis path as this gentle, well-groomed route up the mountain is actually rather dangerous in winter. Fortunately we can turn to Elfyn Jones, BMC access & conservation officer for Wales and member of the Llanberis Mountain Rescue Team, for advice. "The Llanberis path is certainly not the safest route in winter – it’s arguably the most dangerous under winter conditions due to the formation of the so-called 'killer convex' slope on the upper part of the Llanberis path; the cause of more deaths on Snowdon than the rest of the mountain in total. "A better path to use in winter is the Snowdon Ranger, but make sure you get your navigation sorted to avoid going straight over the top of Cloggy!" This minor summit in the Carneddau is often passed over by hill walkers looking for a tick list check (as the 13th highest mountain in Wales at 3,038 feet it only just sneaks into the Welsh 3000ers), but its remote location and knockout summit panorama make it the perfect stargazing location. The snow can really stack up on Carnedd Gwenllian's normally grassy slopes during the winter months, so be prepared to negotiate some deep drifts – and pick an extra-still night to avoid the icy wind that whistles across the mountain’s bare summit plateau. Daytime views north towards Ireland and south to the Berwyn ranges translate at night into horizon-stretching starry skies that will delight amateur astronomers. The sheer remoteness of the Rhinogs creates epic stargazing circumstances – and because these lesser-known hills are smaller and closer to the sea than the major Snowdonian peaks, full winter conditions are rare. That’s not to say that a night walk in the Rhinogydd is an easy proposition (there’s plenty of scrambley terrain around Rhinog Fawr, Rhinog Fach and Moel Ysgyfarnogod), but it’s perfectly possible to plan a summit-bashing route with few major difficulties. Follow the well-preserved remains of an old medieval packhorse trail up from Cwm Bychan for the quickest and most accessible way into the hills. The postcard-perfect little settlement of Beddgelert has an interesting astronomical history. In 1949, a meteorite hit a hotel in the area and smashed its way through the roof to a bedroom below. The noise, according to the Caernarvon & Denbigh Herald, “was heard throughout the village”. Today Beddgelert is popular with photographers looking to capture the Milky Way rising above dramatic scenery. Its main draw for hill walkers, though, is Moel Hebog, the 783-metre peak that towers above Beddgelert Forest and offers panoramic views of this spectacular Snowdonian valley. Approach the summit directly from the Caernarfon road and return past Llyn Llewelyn for the simplest round route. For a quick escape from the lights of civilisation without the difficulties of a winter summit push, follow the Miners’ Track up from Pen y Pass to reach the mountainous shores of Llyn Llydaw – a top spot for aspiring night photographers, thanks to its secluded location and lip-lickingly beautiful surroundings. If conditions allow, the continuation up to Glaslyn lake and the return via the PYG track offers even greater opportunities for scenic star-gazing. Walking on a wintery night may seem like a journey into solitude, but there is still the chance that your adventure may disturb others. Elfyn gives us a few considerations to take to ensure your night is kept all to yourselves. "Lights at night can become a source of false call outs for mountain rescue, so be careful that you don't inadvertently start flashing lights or give the impression that you're calling for help. "It's important to minimise disturbances to local residents. Remain as quiet as possible when walking past houses or residential areas at night. Don’t keep car engines running and prepare your kit before turning up at the car park, this way you'll keep noise to a minimum and spend as little time as possible creating disturbance in car parks or built up areas." This week, the Snowdonia National Park Authority called for mountaineers to ‘stay away’ from Snowdonia due to winter conditions. 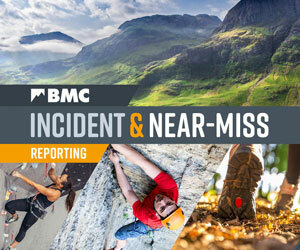 The BMC would like to clarify that the responsibility for decisions around what a mountaineer does in the mountain environment lies with the individual themselves.